Play’n GO collaborates with the Swedish doom metal band Candlemass to create House of Doom. Developers of online gaming content often find their inspiration in unusual places. That’s the case with the Swedish gaming company Play’n GO, which has just announced its latest addition to its extensive portfolio of high-quality releases. Titled House of Doom, the new video slot is the result of an unusual collaboration between the online gaming software produces and the Swedish doom metal band Candlemass. The new game is not only inspired by the famous band but also features a unique soundtrack composed for this occasion. For those unfamiliar with the metal scene, Candlemass were founded in Stockholm back in 1984 and are regarded by many as one of the founders of the doom metal. Partnering with Candlemass was a huge step for Play’n GO. The company’s Chief Executive Officer Johan Törnqvist revealed the developer wanted to evolve the process beyond simply acquiring intellectual property. Törnqvist added the company wanted to involve the band in the process of creating the game. He also stated Play’n GO wanted to ensure that House of Doom would have the right feel and theme for what the game was aspiring to be. Working together with the band was an interesting and above all a positive experience. 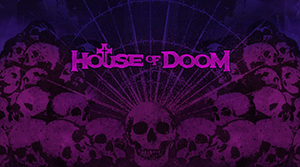 House of Doom is a horror-themed slot, featuring a grim and ominous atmosphere with pentagrams and other related imagery as the symbols on the reels. And while they enjoy the game, players can listen to guitar riffs played by Candlemass, which rounds up this unique experience. As any other slot out there, House of Doom features a number of special features designed to help punters boost their winnings. Scatter symbols, as usual, will trigger the Free Spins round, while the Hellgate feature promises a lot of excitement. Once it’s active, reels will be randomly highlighted, with Wild symbols having the potential expanding and covering an entire reel. That’s not all since the Skulls of Abyss mini-game can also help players grab more cash, this time by picking out the prizes. No matter whether you like metal music or not, this is an interesting game you should definitely check out. You can find House of Doom at any online casino powered by Play’n GO.